My friend, my mentor, my hero. I had the pleasure of meeting Verna when I started backpacking and asked the Appalachian Trail Conservancy if there was an older woman backpacker who I could talk to. They said they thought there was a delightful woman somewhere in the Midwest who would be happy to talk to me and it turned out she only lived hour away! I met her for lunch and couldn't believe this tiny grandmother was such a super hiker. She started backpacking at the age of fifty and thru hiked the Appalachian Trail, all 2160 miles when she was 62, doing it in 5 months and averaging 14 miles per day. If you asked her, she would say it was no big deal, but upon further inquiry, I found out she logged over 45,000 miles along many trails. Some were the North Country Trail, the Michigan Shore to Shore, the Long Trail twice, and the Fingerlakes Trail. The Grand Canyon trips were very special because she took each of her three grandsons on a five day hike for their 13th birthday. In 2000, she attempted her second thru hike, ending after 1620 miles only because she contracted Lyme's Disease. Verna spread joy to anyone she met. This gentle little giant had full support of her loving husband who understood her need to get out into the wilderness. A simple statement by Ken, "she never gave me a hard time about what I wanted to do, so why would I give her a hard time?" Hiking is so much easier when your loved ones support you. She loved seeing wild animals and flowers and meeting people. Although she almost always hiked alone so she could hike her own hike, she always felt that the other hikers were family, looking after her. Very few could keep up with her though, she would start at 7am and end at 5pm each day, stopping every hour or so to enjoy the surroundings. Such a smart hiker, she learned quickly to stop when the body said stop. On keeping her pack weight to a minimum, she told me. "If you need it, take it, if you want it, leave it." 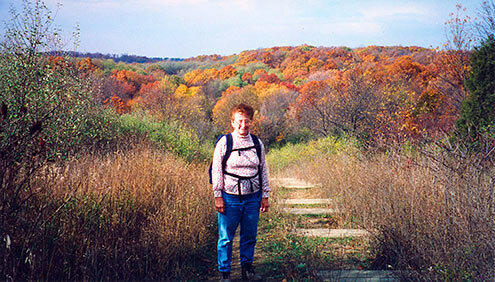 Verna had a thirst for knowledge, always trying to learn to be a better hiker. I laughed when she would ask my advice about hiking poles and lighter weight gear. I would spend more time trying to soak in all the knowledge she could give me. When I asked her if she ever felt like quiting, she answered "no, I don't think so." I said that I was sure there would be times I would sit by the trail and just sob, and she answered, "well, I did that! Then I would just get up and keep on walking" These are the wisest words I can pass on to all hikers.